Michael Green predicts wooden skyscrapers as an option for some of the most sustainable super-structures in the world. With designing a concept for a 30-storey tower in Vancouver, he’s also produced an instruction manual on wooden skyscrapers for other architects and builders. 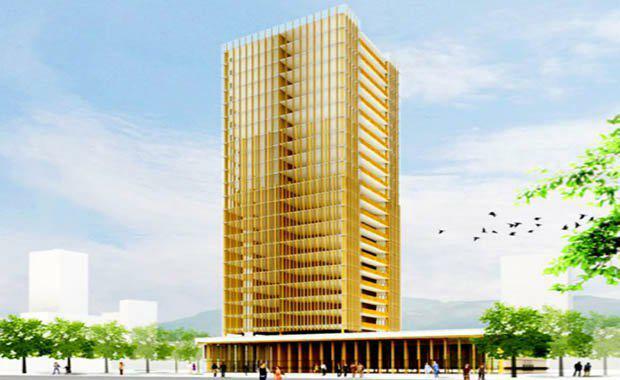 Green plans to develop the 30-storey wooden tower as a prototype to demonstrate the possibilities and advantages of mass timber construction for mid-rise (6-12 storeys) and tall buildings (3 storeys). Green hopes that his research will result in the possibility of using mass timber construction for even taller high rises in the future. Credit: Vancitybuzz[/caption]The goal is to find safe, carbon-neutral and sustainable alternatives to the current structural materials of the urban infrastructure, to encourage architects, engineers and designers alike to think outside the box of conventional design by demonstrating wood as a viable material for tall and large buildings by exposing its environmental and economic benefits. The Vancouver wood building is made from laminated strand lumber rather than steel. The thought is that a wooden tower wouldn’t be as strong or safe as steel is? – Think again. The beams production results in an extremely structurally sound material that can beat fire even better than conventional metal building materials. Credit: Naturally Wood[/caption]Around the globe, mid-rise and tall buildings have been predominately constructed in concrete and steel. The Case for Tall Wood Buildings introduces a new perspective on renewable, durable and strong building materials manufactured by mature. If harvested responsibly, wood may be the best option for the reduction of greenhouse gas emissions and storing carbon in our buildings. The study introduces a new construction model for tall buildings known as ‘Finding the Forest Through the Trees’ (FFTT). This structural solution utilizes mass timber panels – solid panels of wood engineered for strength through laminations of different layers – to create a significantly lighter carbon footprint than the current concrete and steel systems. Preconceptions of mass timber construction are acknowledged throughout the study, showing that this mass timber structures are capable of meeting fire and life safety needs while staying within cost competitive marketplace conditions.